Above: Thanks to newly redesigned green trails, Angel Fire has something for every mountain biker—from rookies to pros. Photograph Courtesy Angel Fire Resort. FOR PATRICK WEST, riding a bike down a mountain is like watching a fast-paced river—it’s all a rhythmic flow. As the singletrack he’s on winds through tight aspens and pines, West pops into the air like a rabbit, whipping the tail of his bike before landing in a plume of dust and rolling into the next feature. He rallies each turn with so much confidence it seems like he designed these trails. Which he did. West, the 33-year-old manager of the Angel Fire Bike Park, wears a black long-sleeve “Trail Crew” T-shirt and Carhartts with work gloves poking out of a back pocket. He has a radio strapped to his chest. Meanwhile, I’m wearing the highly recommended full-body armor: shins, knees, back, stomach, arms, even my kidneys, all covered in pads. But West is on the clock. As he rides, he’ll stop to pick up stray rocks or snap rogue branches. He has shoulder-length brown hair falling from his full-face helmet and the demeanor of a basset hound—real chill—even though it’s opening day and his latest work is being tested for the first time this season. We take a break at a confluence of trails midway down the mountain. West explains the art of the tabletop jump, and how each is designed to a specific height and length so that, if riding the trail at the intended speed, a rider will hit the landing perfectly. “It’s like Zen,” he says. Want more great stories about New Mexico? Subscribe now and we&apos;ll deliver them right to your door. In 2008, West, who says he grew up on a bike, took a trip to Whistler, British Columbia—the epicenter of mountain biking—with Hogan Koesis, a friend from his hometown of Austin, Texas. After the trip, they started building their own rogue trails in the area. One day, while sitting on the lip of a jump, they decided to form their own trail-building company. They called it New Gravity Creations. In 2010, the new company pitched Angel Fire Resort, site of the first real mountain West had ever visited, when he was a boy. Angel Fire began offering lift-accessed mountain biking in 1995 with little more than a few rough trails, even when it hosted the 2005 World Cup. New Gravity Creations had limited professional experience, but to West’s surprise, the resort’s honchos said yes. West and Koesis spent the first season designing a handful of trails while living out of a pop-up trailer next to a creek. Eight years later, Angel Fire claims a dedicated mountain-biking community. 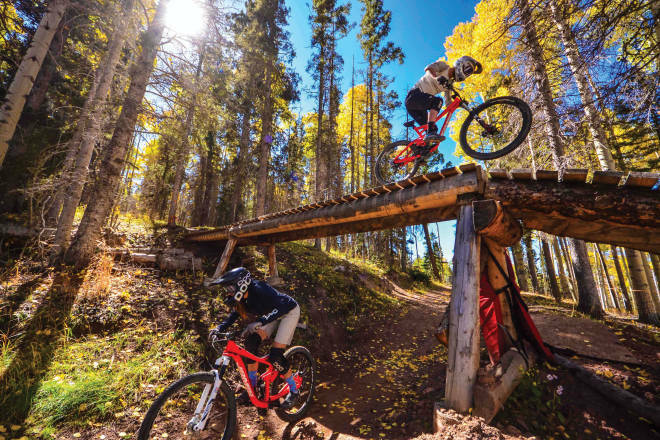 With 2,000 vertical feet and 31 well-marked trails covering 60 miles, plus the longest season in the country (typically from mid-May to mid-October), it’s one of the most respected bike parks in the region. Whistler’s legendary park, by comparison, has 97 trails over 46 miles. “It has all the best parts of Colorado bike parks in one place,” says Robert Klima, who lives in Keystone, Colorado, but holds a season pass to Angel Fire. On a Friday in mid-May, hundreds of expert downhill mountain bikers converged for opening day. In the afternoon, some grilled lunch in the parking lot while others sat on tailgates drinking beer—their first day of the season already in the books. I got on the chairlift with West, and we talked about the mellow New Mexican mountain-biking scene. At the top, we hopped on our bikes and pedaled toward Easy Street. It was a smooth, obstacle-free, wide trail—their easiest one—and we cruised slowly through the thick forest. Midway down, we decided to up the degree of difficulty slightly and pedaled down Combi, a narrower but still low-risk green trail. Natural resting areas lie at the intersections of trails; maps show riders how to change course throughout. I hadn’t ridden a bike park before, so I appreciated that I could take baby steps. When we got to the bottom, West thought I was ready for a blue trail. After taking another lap on the greens and feeling comfortable, I thought I was, too. We hit Ziggy, a short, narrow, rocky section at the top of the lift that led us to Sierra, which we rode without incident—but with increasing pace—until we got to the start of Chutes and Ladders. West warned me that we’d go across bridges with steep drops. Some riders build up speed and launch off the lips of the structures. He encouraged me to approach them more slowly, with my weight back and most of my braking force on the rear wheel. I managed my bike across an elevated, narrow wooden boardwalk. Then we twisted our way through the forest. We approached a series of bridges, each one longer, each descent steeper. I took them very slowly. It was riveting. For my last lap, I rode Boulder Dash, another blue trail. West told me that, at his last count, Boulder Dash, one of the marquee trails at Angel Fire, has 128 jumps. It runs 1.6 miles down 800 vertical feet. The sun was starting to dip. Clouds hovered around the mountaintop, but it was an otherwise blue, warm day, with views of Wheeler Peak. Feeling a new sense of confidence, I wanted to ride the trail fast, top to bottom. I hovered above my seat, rolling with the trail all the way. I didn’t clear a single tabletop. It wasn’t quite Zen, but it was really fun. My number-one recommendation is to get a lesson. It will make your day way more enjoyable. We have different levels of instructors, from beginner to learning-to-jump. Getting on the right equipment is massive. There are all kinds of different bikes out there. When you come to a gravity park, you want to be on a gravity-specific bike. You have front and rear travel [suspension], big disc brakes that are really powerful and will stop you, and knobby tires. Wear elbow pads, kneepads, full-face helmet, and decent shoes. Start out on a green trail. Get comfortable and then move to the next green trail. Do Easy Street, then Combi, then maybe Sierra, which is more of a singletrack—a technical, tight, and twisty green. It’s super fun. And then you can go on to blue trails. Can’t make it to Angel Fire? Try these tips and trails for beginners from three bike shops throughout New Mexico. Angel Fire Bike Park’s 2018 season runs daily May 18–August 12, and Friday–Sunday August 13–October 13. All-day tickets cost $49 (ages 13–64), $30 (ages 7–12 and 65-plus).Full-face helmets, elbow pads, kneepads, and full-suspension bikes are highly recommended and available for rent at the on-site bike shop. Signed waivers are required to ride (800-633-7463, nmmag.us/afbike). Not everyone in the family wants to ride? Angel Fire also has a disc golf course, zipline, hiking, and scenic chairlift rides throughout the summer. Angel Fire Resort features high-end lodgings, plus a campground, which includes a washing station, porta-potties, and community fire pit (800-633-7463, nmmag.us/afresort). Find a full trail map and list of services at angelfireresort.com.